In the fall of 1879, a group of Mormon volunteers collected their wagons, families, livestock and supplies at a spring in Fortymile Gulch, just north of the Kaiparowits Plateau cliffs and just south of the canyons that make up the Escalante River Basin. A small group went ahead of the rest to scout out and prepare a crossing of Glen Canyon and the Colorado River. While parts of the area are relatively benign for travel, the whole region is criss-crossed with deep canyons, some of them bordered by 1,200' sandstone cliffs. As they approached Glen Canyon, they spied Cottonwood Canyon on the eastern side of the Colorado and thought it would be a good place to regain the heights after crossing the tiver. 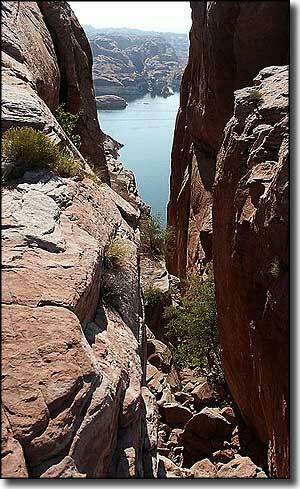 Then they found a narrow, steep crevice in the western wall of Glen Canyon that they named "Hole in the Rock." They spent a couple months working over the Hole in the Rock pathway, using blasting powder to widen parts of the upper section and chiseling anchor points (to attach ropes to) directly into the rock. The lower section crossed a gully full of large boulders so they built a wooden trackway around it. Finally, on January 26, 1880, 250 people, 83 full-sized wagons and more than 1,000 head of livestock began the journey down through the crevice to reach and cross the river. The wagons were heavily roped and attached to teams of men and oxen to be lowered through the almost 45° slopes in the upper part of the canyon. It was an arduous mode of travel but 1/3 of the expedition reached the river on the first day, the rest being down to the river by January 28. Charles Hall had built a wooden ferry at the river and everyone was soon across with no damage. 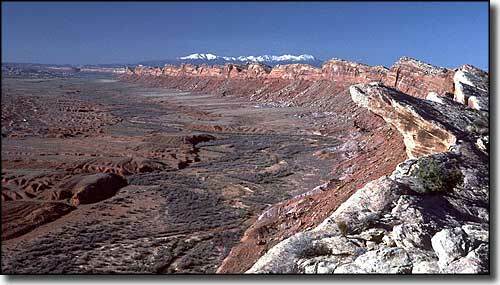 Then they had the much harder task of ascending Cottonwood Canyon and traveling into southeastern Utah. The maze of canyons east of the Colorado forced the expedition to go north until they arrived on top of Cedar Mesa (near present-day Natural Bridges National Monument). From there, they made their way down into Comb Wash and headed south for the environs of the San Juan River. Finally, they decided they'd had enough and settled into what is now known as Bluff. The journey was originally planned to take six weeks, they ended up taking six months. Nobody died along the way but two children were born. The route continued to be used for supplies for maybe one year, then Charles Hall moved his ferry crossing north on the Colorado to a place that made for a much easier crossing of the river. These days, Hole in the Rock is reached via the primitive Hole in the Rock Road, a long route that heads southeast from Utah Highway 12 just east of Escalante. The bottom of the canyon can be reached from the east only by boat on Lake Powell (Buoy 66).